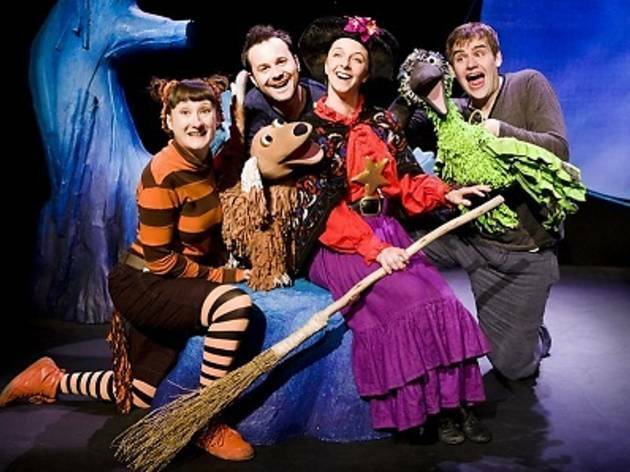 Narrated by some happy campers, the tale of a friendly witch whose broomstick breaks when she picks up too many animals – including a dog, a frog and a bird, as well as the witch’s own cat – after they help her find her lost hat, wand and bow, is originally written by the same power duo that created The Gruffalo. 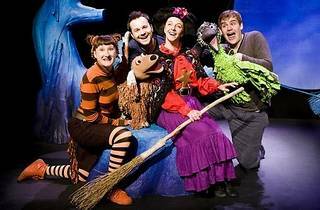 Featuring a Welsh dragon, a snazzy broom that lights up and a repertoire of catchy tunes, there is a lot going on in this show both visually and plot-wise, which means that older siblings will enjoy it too. The animals, who are manipulated by skilled puppeteers, will be greeting everyone in the auditorium before the show starts – so don’t be shy and be sure to go say hello! Suitable for ages 3 and up; approx. 60 mins.